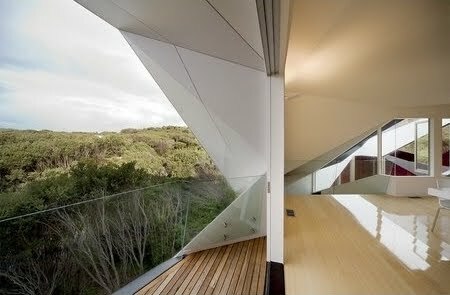 This holiday home is situated in sand dunes full of trees, directly behind 16th beach at Rye on the Mornington Peninsula, only two hours from Melbourne. There was in this home to be the sense of arriving at a natural and built environment which was unique and in complete contrast to the owner’s city home. The architects, Mc Bride Charles Ryan practice in Melbourne, began with the idea of the spiral, an acknowledgement of the end of the weekend journey to the beach. 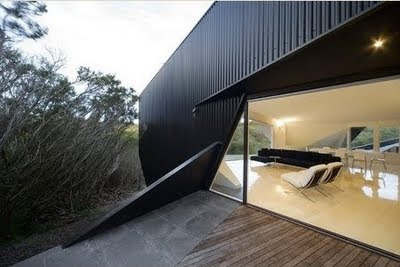 An Australian icon, McIntyre’s 1950’s Snellman House came to mind. As the project developed they carefully considered where the building should be located, its relationship to the prevailing winds, and possible points of entry, topography and vegetation. Subjected to numerous distortions, the topology of the spiral gave way to the topological classic The Klein Bottle. 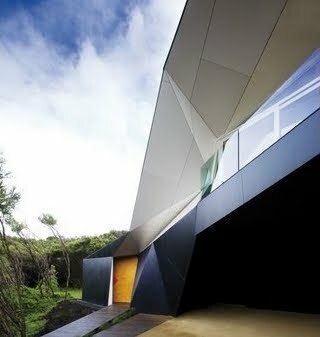 The architects were keen to remain topologically pure, to distort the shape as need dictates but not to appear to sever this form. The idea of the origami version of the Klein bottle was attractive to them, not just because it was able to be approximated in cement sheet (the resonance with the ubiquitous 1950s fibre shack was compelling) but both because of its beauty and the perversity of an origami Klein Bottle. To accommodate ‘rooms’ within the bottle they thought of them like objects inserted (the ship) within the bottle. The mathematician’s complex topological surfaces like the Klein bottle are appealing to many architects. They look like the new architecture of the computer age, and hold the promise of new form and spatial sequence. Radically they merge the floor, wall and ceiling, inside and outside. The fact that there are so few examples is evidence that they are actually almost impossible to achieve in reality. In this project, the Klein bottle was the perfect fit to the constraints of the site. Once adopted, the shape of this building had something of a life of its own, the genie was out and she was difficult to temper. The development was intense, the serious pursuit of joyful nonsense. The result is a unique shape and internal space, an unexpected entry sequence and series of new relationships between the traditional components of the home. The process was also a reminder that architecture does not spring naturally from place, and yet it is the beautiful abstract idea, that when carefully selected and developed can suddenly seem as natural as the tee tree that surrounds it. The building required extensive use of 3d software for both its development and eventual execution. The building is largely steel framed, the complexity of which required the architects to develop representations for use in the shop drawing and production process. It is a lightweight structure largely clad in cement and metal sheet; incombustible and lightweight, these materials meet stringent fire overlays. It harvests water, is double glazed and the large cavities between the external and internal cladding allow packing with bulk insulation. The central courtyard adds cooling and cross ventilation, Windows are hardwood, the flooring is bamboo and the artificial lighting was selected with efficiency as a primary concern. 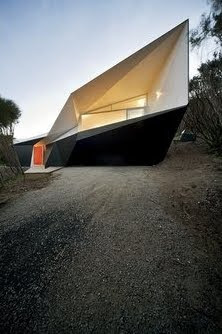 The project was awarded first prize in the House category at the World Architecture Festival Awards 2009. 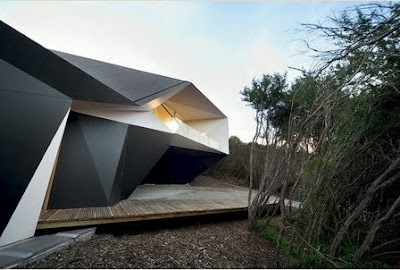 This article was first posted on 2Modern Design Talk blog on 22nd of November 2009.